The Fear Freesm initiative was started by Dr. Marty Becker and focuses on creating a veterinary experience that keeps your pet in a calm and happy state of mind. At Poulsbo Animal Clinic, staff are trained and certified in Fear Freesm protocols. 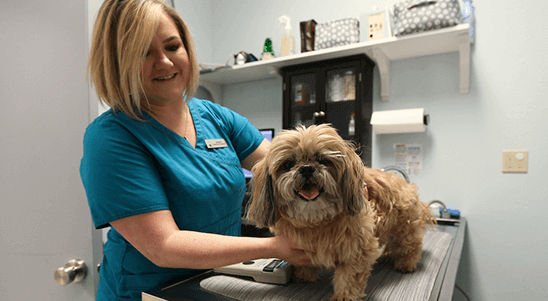 Making the veterinary experience the best it can be for your pet is both a passion and a goal of ours. Common differences you will note at practices with Fear Freesm-trained staff include the use of treats and praise throughout the visit. If your pet has an allergy or food sensitivity, be sure to let us know ahead of time and bring along the high value treats you use at home. Some pets respond better to toys, so feel free to bring your pet’s favorite toys so we can play and diffuse anxiety throughout the appointment. The Fear Freesm experience starts at home so please call us today to find ways of managing your pet’s fear, anxiety, and stress even before getting in the car. Prepare for your appointment the Fear Freesm way! For cats, be sure to use a sturdy carrier with two doors or a removable top. Cover the carrier with a towel to decrease visual stimuli and allow your cat to feel safe and hidden inside. Support the carrier from the bottom to eliminate any swinging motion during transit. And consider using Feliway (a feline calming pheromone) sprayed around the carrier and towel. For dogs, general training can be helpful during the vet appointment. You can also bring your nervous pet in ahead of time for a social visit, which may help decrease stress and make your pet feel more comfortable at the time of his or her appointment. If your pet needs a muzzle for the safety of themselves or others, consider training them ahead of time to wear a basket muzzle so we can continue to positively reinforce the experience and feed exceptionally tasty treats during the appointment. Contacts us today to learn more about the Fear Freesm experience.